Happy Wednesday, everyone. 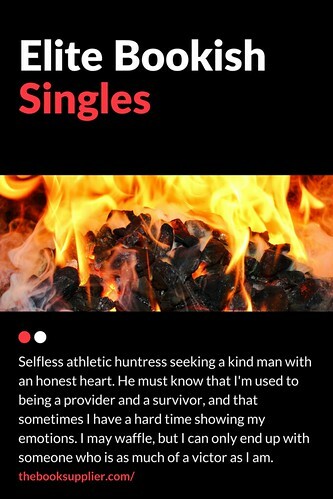 It’s time for our lovely bookish game, Elite Bookish Singles. If you’re curious about the answer to the single’s ad from two weeks ago, scroll all the way down. This week’s single is from young adult literature. She’s one whose love triangle made us all groan, I’m sure. Leave your guesses, thoughts, or suggestions for future personal ads in the comments. Last time’s answer: Daisy Buchanan from The Great Gatsby by F. Scott Fitzgerald. It was really inspired by the picture of the yellow car. Right? I just read a Top Ten Tuesday post about books that need less romance in them, and The Hunger Games was definitely on the list. I think Bella Swan takes the cake on the waffling, though. Thanks! It’s based on a game I heard on NPR’s Ask Me Another last month. I thought it’d make a fun original post.